However, Blyleven's early career with the Twins was not always pleasant as he was hounded by critics and fans. Unhappy with his salary there, Blyleven was traded to the Texas Rangers in a six-player deal on June 1, 1976, along with teammate Danny Thompson. He pitched well with the Rangers, posting a 15-5 record with a 2.76 ERA. On September 22, 1977, just two weeks after being sidelined with a groin injury, Blyleven no-hit the California Angels 6-0 at Anaheim Stadium. His 2.74 career ERA with the Rangers remains the best in team history. Then, following an incident in which Blyleven blatantly gave the finger to a television camera obviously focused on him during one of the Rangers' rare nationally-broadcast games, Blyleven was again traded on December 8, 1977 to the Pittsburgh Pirates as part of the first four-team trade in Major League Baseball history. Blyleven's no-hitter was with his final start as a Ranger; not until Cole Hamels during the 2015 season would a pitcher be traded after pitching a no-hitter in his final start for the team that traded him. With the Pirates, he led the team in ERA, strikeouts and complete games in 1978 and helped them to a World Series victory in 1979. 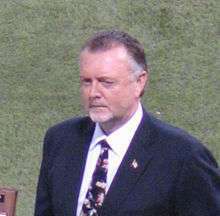 Blyleven was inducted to the Hall of Fame in 2011 after receiving 79.7% of the vote on his 14th attempt. "It's been 14 years of praying and waiting", he said on a conference call from Fort Myers, Florida "I thank the baseball writers of America for, I’m going to say, finally getting it right." Blyleven was the first Dutch-born player inducted, and his Hall of Fame plaque depicts him with a Minnesota Twins cap. ↑ Kallestad, Brent (June 2, 1976). "Blyleven traded to Texas in six-player transaction". Lewiston Daily Sun. Maine. Associated Press. p. 20. ↑ Kiley, Mike (June 2, 1985). "Indians' Blyleven The Subject Of Angel Trade Talks". Chicago Tribune. ↑ Steve Ginsburg (2009-01-29). "Ponson to play for Netherlands in World Classic". Reuters. Retrieved 2009-01-29. ↑ Stark, Jayson (December 31, 2010). "Bert Blyleven, Roberto Alomar so close". ESPN.com. Retrieved January 5, 2011. ↑ "Henderson, Rice elected to Hall of Fame". National Baseball Hall of Fame and Museum. Archived from the original on January 23, 2009. Retrieved 2009-08-27. ↑ Gallery – Blyleven inducted into Twins Hall of Fame Archived January 9, 2011, at the Wayback Machine.